All photos by John Vettese. A Visit with the Mayor of Sidsville was written by World Cafe host David Dye for the World Cafe Sense of Place Lafayette series..
At sunset, I found myself following a short, compact black man with gold teeth and a cowboy hat along a semi-rural highway in Lafayette Parish, Louisiana. 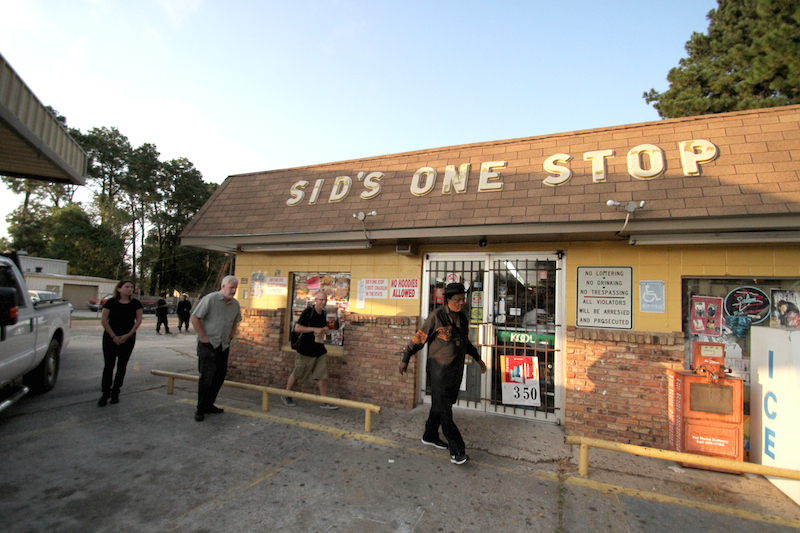 We were coming from El Sido’s Zydeco and Blues Club, a no-frills concrete bunker of an entertainment establishment, and headed toward Sid’s One Stop, past Sid’s beauty shop. It’s not on any map, but we were in Sidsville. 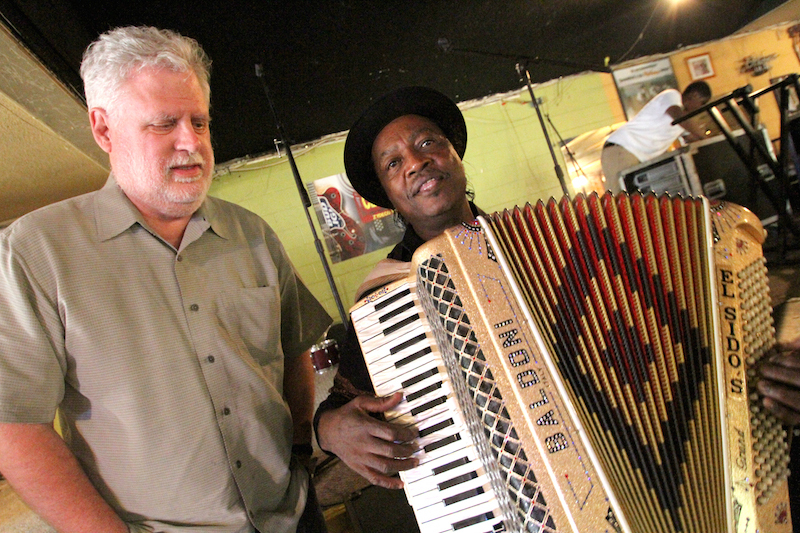 The unofficial mayor of Sidsville is Sid Williams, one of the most colorful characters in Louisiana’s zydeco world. 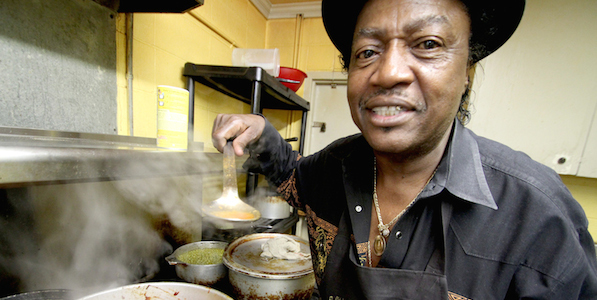 His best friend is Stanley Dural, Jr., Buckwheat Zydeco. Buck used to live in the apartment building across from El Sido’s until he decamped to his ranch. Sid and Buck talk five, six times a day. Sid’s younger brother is Nathan Williams, of Nathan & The Zydeco Cha-Chas. His nephew is Little Nate of The Zydeco Big Timers. Family. The elder Williams doesn’t play Zydeco professionally. He has too many other business ventures, but he did pull out his gorgeous piano accordion to play a bit. The “mayor” doesn’t have to do a whole lot to let you know that this is his turf. It’s easy to tell, from the people leaning out of car windows to pay their respects to the kids who swing their bikes around in the dust just to say hello. As we walk along North St. Antoine St., every person seems to be related to Sid in some way although, honestly, there were so many kin that, after out short stroll, it was exhausting to remember. Sid’s Beauty Shop is on the down low with minimal signage, but you can’t miss Sid’s One Stop. It’s a bright, thriving establishment that seems to be the economic engine of Sid’s domain. His wife, Susanna, she of the renowned big gold hair, is in the high seat behind the counter selling beer, candy and an array of delectable smelling food coming out of the cramped kitchen. Sid takes his honored visitors in among the big pots and burners for a taste of the jambalaya and raccoon stew that he’s cooking special for our dinner. Back at El Sido’s, as the music swells, Sid hunkers down at his worn stool at the end of the bar. You are not going to put anything past Sid tonight, not in Sidsville.